WAH - Work at Home - Enables to install the product on home computer of an employee. OEM - Original Equipment Manufacturer - Software to be sold only with a new computer (or with hardware, e. g. motherboard, HDD). OEM SW must be used with a certain computer or component. When you put the computer out of service, the SW cannot be used anymore. MLP - Multilicense - The right for using the product. The customer gets the receipt, but gets no manual and no documentation. SA (Software Assurance) - the right to run the latest version of any purchased product during the agreement term. Software Assurance replaces the complexity of one-time upgrades of the programs - version upgrade, product upgrade, competitive upgrade, language upgrade, Upgrade Advantage (UA). It allows the user to install any new version of the program for which the Software Assurance was purchased and this right is valid during the term of the SA agreement. Software Assurance can only be purchased upon buying new licenses or as 2-year agreement renewal. Operating systems and server products purchased as OEM or as a pack can be ranked among SAs during the period of 90 days after the purchase. OEM and application pack licenses (including and especially Microsoft Office) CANNOT be ranked among SAs. L&SA - License + Software Assurance - a pack containing a license + the right to run the latest version during the perion of 2 years or during the rest of the term of the Open License agreement. Bundle - a pack containing two or more products purchased for a favorable price (e. g. operating system + a pack containing some other programs for a favorable price). Sometimes it can be a combination of licenses for both HW and SW. Disk Kit - a pack containing installation media without license, but allowing to use the SW.
Doc Kit (Documentation Kit) - a pack containing product documentation. LUP (Languague Upgrade) - an SW version of a product designed for upgrading the program. It is usually the same product and the same version but in other language than the current version. NFR (Not For Resale) - this version of a program can only be used for testing or for customer presentation. Open Subscription License (OSL) (since the end of 2001) - License agreement for companies with at least 10 PCs. For some SW products made by Microsoft you can get non-perpetual licenses for all PCs in your company, paid by 3 annual payments during 3 years. The price for the OSL for 1 year is calculated as the price for a license + the price for Software Assurance for 3 years (3 x 29% for applications and systems, or 3 x 25% for server products), divided by 3 (3 annual payments during 3 years). The price calculated this way will be reduced because the customer purchases (unlike Open License) just non-perpetual licenses. Moreover, the customer is bounden to use these licenses on all licensed computers. If the customer wants to change the non-perpetual license to a perpetual one, it is only possible at the end of the agreement term  the price for this change is 1,5-fold of the annual payment. The customer is entitled to upgrade to any new release of the purchased program, but has to pay for all licensed computers. 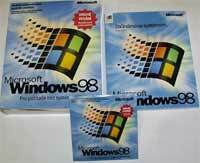 For OS on stations, there is only Windows Pro in Upgrade version available :-( . Microsoft Open License (OPEN, OLP, MOL) - Licensing program - a volume license agreement that enables the customer to purchase licenses at a discount which is also valid for other purchases during the following two years. This agreement allows the user to install and use a Microsoft product on given amount of PCs. Downgrade - an expression for the permission to legally use a previous version of the purchased product. E. g. you have purchased Office XP Pro, but your HW or SW appear incompatible, so you have to use some older version - Office 2000 or Office 97. Licensing programs - this is a very complicated field and the first sight need not always be right. Before you decide you should properly compare all possibilities taking in account the price and the future. Many companies choose the combinationi of licensing programs, full versions, OEM versions and the Linux operating system.